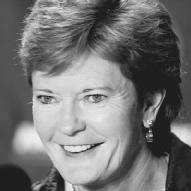 Pat Summitt, head coach of Tennessee University's women's basketball team, the Lady Vols, is one of the most successful coaches in collegiate basketball history. She has won six NCAA titles—only John Wooden, former coach of the men's basketball team at UCLA has won more, with ten NCAA championships to his credit. Summitt began her career as a college basketball player, later playing in two Olympics. Hard work, drive, and determination have led her to over eight hundred career wins in less than thirty years. Summit was born Patricia Head on June 14, 1952, in Henrietta, Tennessee. She was the fourth child and only daughter of Richard and Hazel, who ran a farm. Summitt participated in all the chores necessary on a farm, and learned how to hold her own against her older brothers. She also learned basketball from them. Most evenings, after completing their chores, she and her brothers would climb the twenty-foot barn ladder to the top of the hayloft and play two-on-two basketball. She loved the game but, once she reached high school, she found out that her school district did not offer girls' basketball. Her father, supportive of her talent, moved the family across the county line to a school district that had girls' basketball. Summit graduated from Cheatham County High in Ashland, in 1970. She then attended the University of Tennessee-Martin, earning a bachelor's degree in physical education in 1974. As a college student, she played with the Lady Pacers, the university's women's basketball team. As a junior she played in the U.S. World University Games, held in the Soviet Union, winning the silver medal. She hoped to play on the U.S. Olympic team, but those hopes were nearly dashed when, during her senior year, she suffered a knee injury. An orthopedic surgeon told Summitt that she would not be able to play basketball again. But Summitt would not give up. Strengthened by her father's insistence that the doctor "needed to fix her knee because she was going to the Olympics," Summit told her best friend, according to Sports Illustrated, "That doctor's crazy as heck if he thinks I'm not going to play ball again!" The upcoming 1976 Olympics in Montreal, Canada, would be the first time that women would play Olympic basketball, and Summitt did not want to miss out in this historic opportunity. "I tell kids ... 'If you're lazy, stay as far away from me and our program as you can because you'll be miserable.' We work hard." After graduation, she was offered a job as the women's basketball assistant coach for her alma mater. After the head coach quit to pursue Ph.D. studies, Summitt, just twenty-two years old, was made head coach. She had never coached a game before and had no assistant coach. But she pushed her fear aside and threw herself into this new challenge. In addition to coaching, she also worked on her master's degree and taught physical education courses. At the same time, she worked on healing her knee and training herself for her Olympic dream. She worked out twice a day, losing twenty-seven pounds. Within a year, her knee was well enough for her to compete in the 1975 Pan American Games. The U.S. team won the gold medal. She was then named to the U.S. Olympic team and selected co-captain. The team claimed the silver medal in Montreal. Summitt returned to her duties as head coach of the University of Tennessee-Martin's Lady Volunteers (often called simply the Lady Vols), guiding the team to the National Collegiate Athletic Association (NCAA) Final Four. The Lady Vols finished 16-8 that season. Summitt continued to play herself throughout the rest of the 1970s, playing in the World Championships and the Pan American Games. She looked forward to the 1980 Olympics in Moscow, but was forced to sit this Olympics out, since the United States boycotted the 1980 games in protest of the 1979 Soviet invasion of Afghanistan. But in 1984 Summitt went to the Olympics once again, this time as a coach. The U.S. team won the gold medal, securing its place in history as the first U.S. women's basketball team to take home the gold. Her coaching success continued at the University of Tennessee, where she won the NCAA championships in 1987 and 1989. She was then granted the Basketball Hall of Fame's highest honor, the John Bunn Award. This 1990 award marked the first time that a woman had been so honored. In the 1990s the Lady Vols won four NCAA championships: 1991, 1996, 1997, and 1998. The team became the first women's basketball team ever to win three NCAA titles in a row. 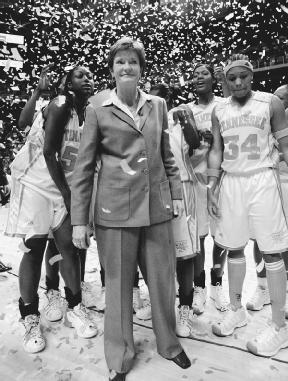 Pat Summitt (center), with the Tennessee Lady Vols after her 800th career win, January 14, 2003.
coach to be inducted. Also in 2000 she was named the Naismith Coach of the Century. Despite all these awards, Summitt would not accept full credit for the success of the Lady Vols. "It bothers me that there is so much focus on me...." she told Antonya English of the St. Petersburg Times. "It's about players; put the focus on the players." The success of her players, however, is due in part to the high expectations Summitt has for them. She demands that they perform well academically, and insists they sit in the first three rows of their classes. Every player who has stayed with the Tennessee program has graduated. Her players describe Summitt as a harsh taskmaster, but also very caring. She pushes them to excel, and instills in them the same strong work ethic that she first learned on the family farm. According to her profile on the University of Tennessee Women's Collegiate Athletics Web Site, she "constantly challenges them to reach their potential as a student and an athlete." In January of 2003 Summitt became the first female coach to win eight hundred games. The following season she coached her one-thousandth game. Summitt is also the coauthor of two books; Reach for the Summitt (1998) is a motivational book, and Raise the Roof (1998) chronicles the Lady Vols' undefeated 1998 season. More than that, the book, said Summitt according to Sports Illustrated, "is about trading in old, narrow definitions of femininity for a more complete one. It's about exploring all the possibilities in yourself." Ron Fimrite noted in Sports Illustrated that the book "represents a gratifying breakthrough in the literature of women's sports." Additionally, Summitt is involved in numerous community organizations. She is a spokesperson for the United Way, Juvenile Diabetes, and Race for the Cure. She also serves as spokesperson for Verizon Wireless' HopeLine Program, which collects used cell phones, resells or recycles them, and donates the proceeds to victims of domestic violence. In 1980 she married R. B. Summitt, a bank executive. The couple lives in Knoxville, Tennessee, with one son, Ross Tyler Summitt. English, Antonya. St. Petersburg Times (March 9, 1999): p. 1C. Fimrite, Ron. "Sky's the Limit." Sports Illustrated (November 16, 1998): p. 15. Smith, Gary. "Eye of the Storm." Sports Illustrated (March 2, 1998). "Pat Summitt Profile." University of Tennessee Women's Collegiate Athletics. http://utladyvols.collegesports.com/sports/w-baskbl/mtt/summitt_pat00.html (accessed on August 25, 2004). "Patricia Head Summitt." Biography Resource Center Online. Gale Group, 1999. http://galenet.galegroup.com/servlet/BioRC (accessed on August 25, 2004). Pat Summit is the best coach but Geno is king of getting there. But I hope that Pat Summit passes John Wooden NCAA Championships. I hope Pat Summit gets A National Championship when Candace Parker is still at Tennessee. To me Pat Summit will get over 1,000 Career win before I hope not soon retires.